“Oh, maybe sixteen or twenty,” is the usual answer. That’s not nearly enough. For every great photo you see online or in print, there are anywhere from 20 to 500 terrible photos that came before it. As a matter of fact, the more bad photos you take, the closer you are to being a pro! As easy as digiscoping with a smartphone can be, there are some tried and true photography tips that come into play and those tips are what lead to the fantastic photos you see on Digiscoping Gurus or Worldwide Digiscopers pages on Facebook. Take a day and take as many craptastic photos as you can. It’s very easy to delete them, but use that time to see what works and what does not. Find a bird feeder either in your yard, a friend’s yard or nature center. Pour yourself a cup of coffee or soda and just allow yourself a few hours of time to get to know your setup. Figure out which feeder gets the most activity, aim your kit at that feeder and practice focusing. Even if a bird isn’t there, just focus on the feeder and take a few shots. As you focus on the feeder, inevitably a bird will fly in and you’ll mostly be in focus at that point. 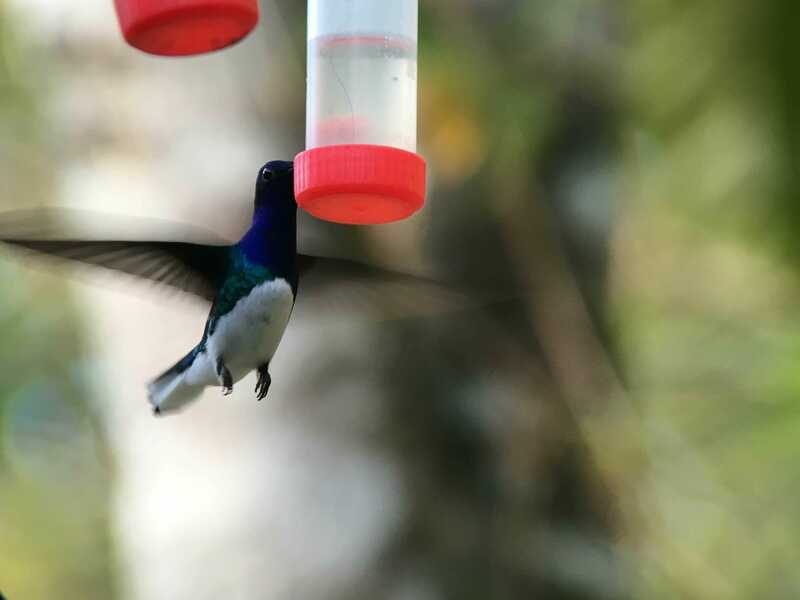 Bird feeders are a great way to practice using your equipment. As you watch the birds move, you’ll notice that some like the White-necked Jacobin may perch on a nearby branch while not feeding you can try to get “natural” shots. Photo by The Birdchick. If you want to try and get shots of birds that come to the feeder but don’t want the feeder in the shot, consider placing branches nearby. The birds will often sit on those branches before coming into the feeder and if you aim your setup at that you can get some “natural” looking shots. On an overcast day you don’t have to worry about sun angle so much. But when it’s out, it can affect your shots. Many photographers like the golden hour of just after sunrise or just before sunset when the birds are in a lovely golden light that brings out their colors. The harsh glare of the noon day sun can really wipe out colors and bring on heat shimmer that will make it impossible to get a sharp photo. When the sun is out, try to keep it behind you so you are using its brightness to light up the bird. Keep this in mind when you’re looking for places to digiscope birds. This can save you a lot of time in the field when you’re planning on going out. Photography blinds at lakes and wetlands can be fun, but they’re useless to you if the sun is facing the blind when you go. A very handy app for planning your outing and thinking about sun is the The Photographer’s Ephemeris available for both iPhone and Android. If you are setting up feeders in your yard so you can digiscope birds, try to keep sun angle in mind to make getting shots easier. The advantage of using a spotting scope and smart phone to take pictures of birds is that you can give the bird a comfortable distance. However, that doesn’t mean that eagle nest that is two miles away is going to be a great picture. Yes, you can see it in the scope and depending on the quality of your scope have a great view, but a warm day will give you lots of heat shimmer making a tack sharp photo impossible. The closer you get to your subject, the less atmosphere you will have to deal with while taking the photo. Here's a series of photos showing you the difference in quality from distant bird shots to those that are much closer. This is an ok shot of a Turkey Vulture that was very far away. To get better photos, try to get closer with scaring the bird and get it in a more colorful background than the sky. Photo by The Birdchick. 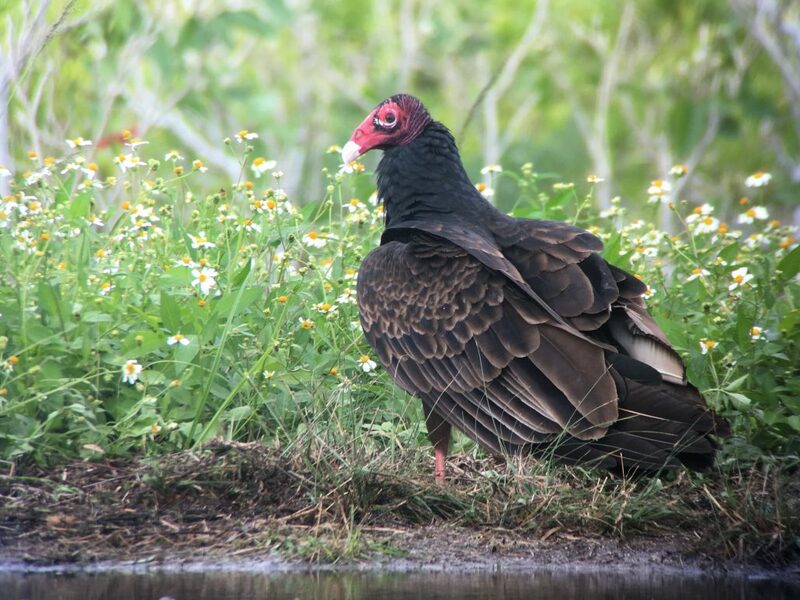 Note the Turkey Vulture is on the ground with grasses and daisies behind it. 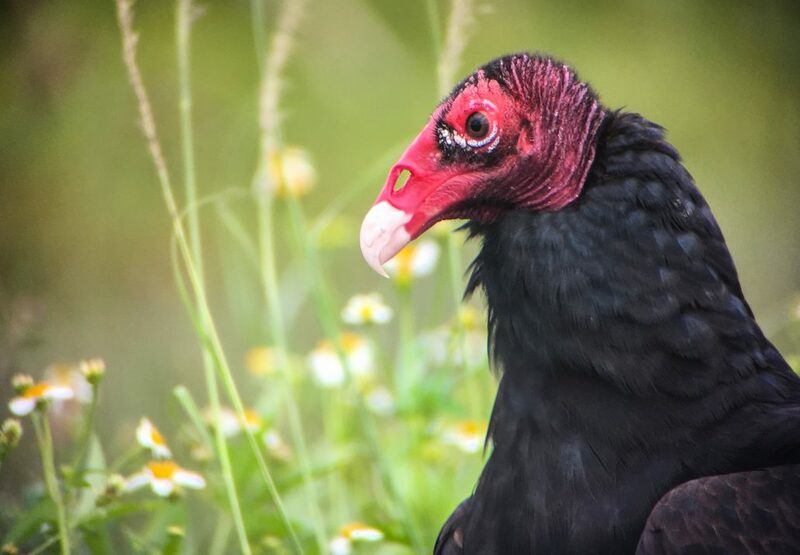 This colorful background enhances the colors of the vulture’s head and feathers. Photo by The Birdchick. 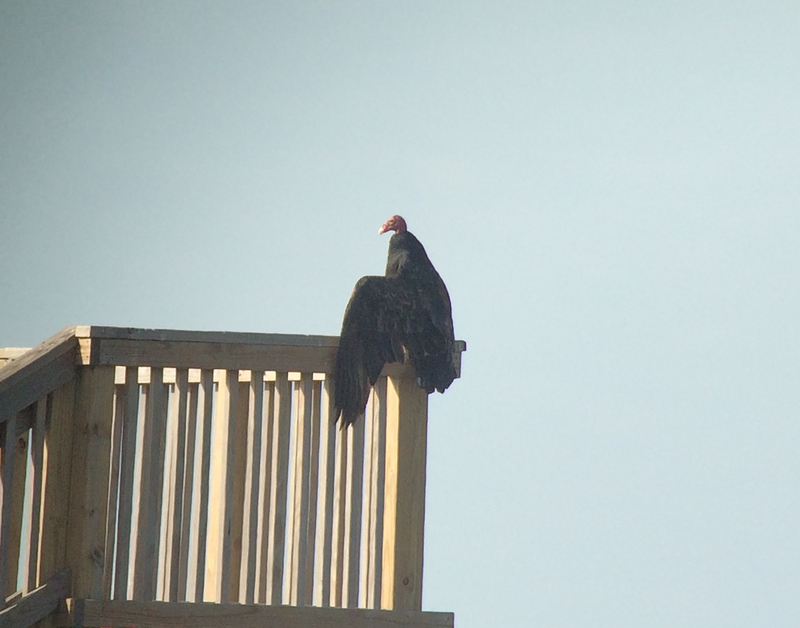 This is the same turkey vulture but a little closer. I waited until the bird was preening its feathers and took twenty steps closer and got a head shot. I dared no closer, vultures vomit in self defense. Photo by The Birdchick. A nice piece of article. I like taking photos especially in the natural grasslands, forests and other bird habitats. I meet scary and unique bird species occasionally when I am out enjoying my leisure time and I sometimes fear getting that closer. I was thinking of getting a stronger set of binoculars or a more powerful Camera which can take clear photos without necessarily getting closer to the species.